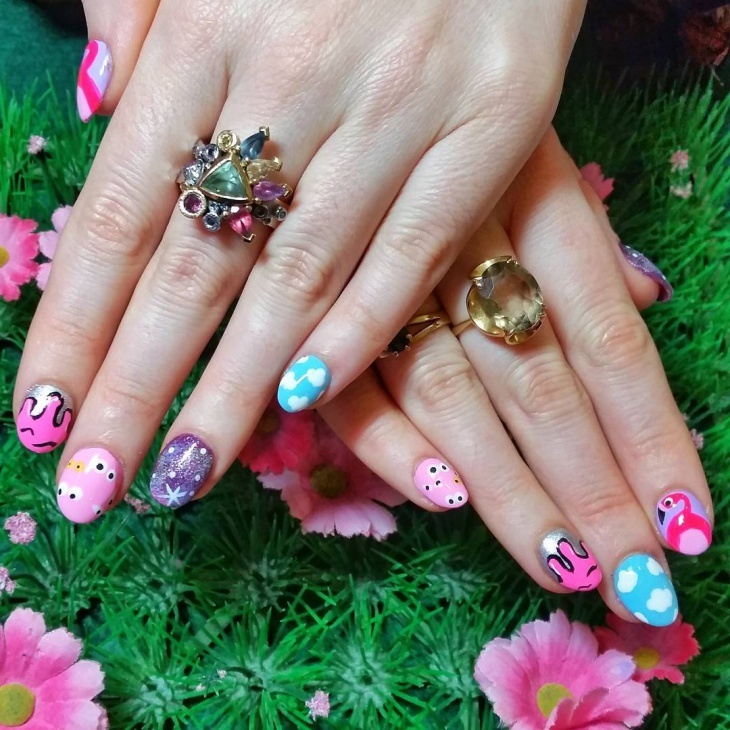 Nail art is a trendy way to decorate the nails. Earlier colorful shades of nail polish or nail colors were the only way to decorate the nails. Then came the glitters and the nail clip arts that were used to enhance the beauty. 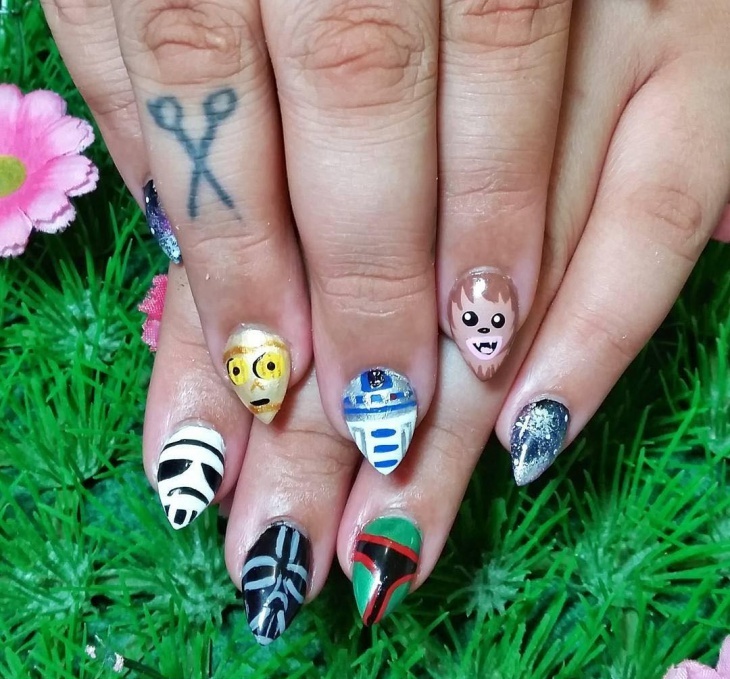 Now nail art which uses a concept to decorate nails is the in thing. 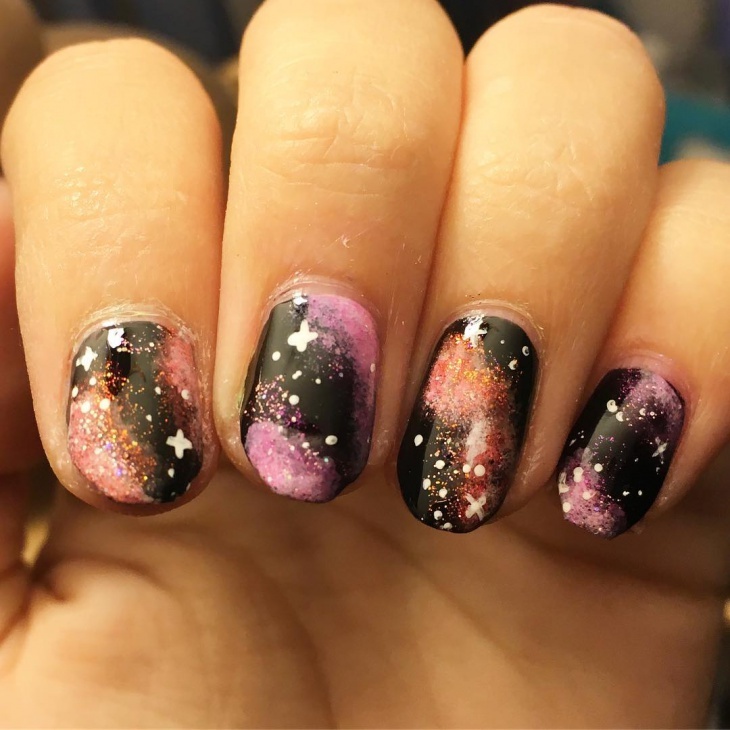 The Galaxy nail art is one trending concept to decorate nails. 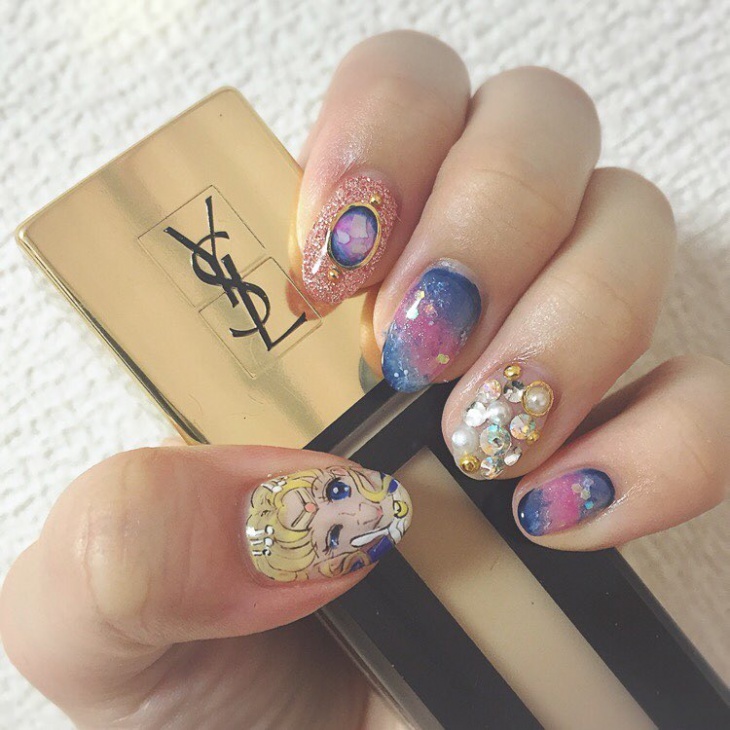 In this, the nails are painted in shades of pastels or dark colors as black, blue and then glitter or the symbols of stars are drawn to bring the effect of Galaxy. 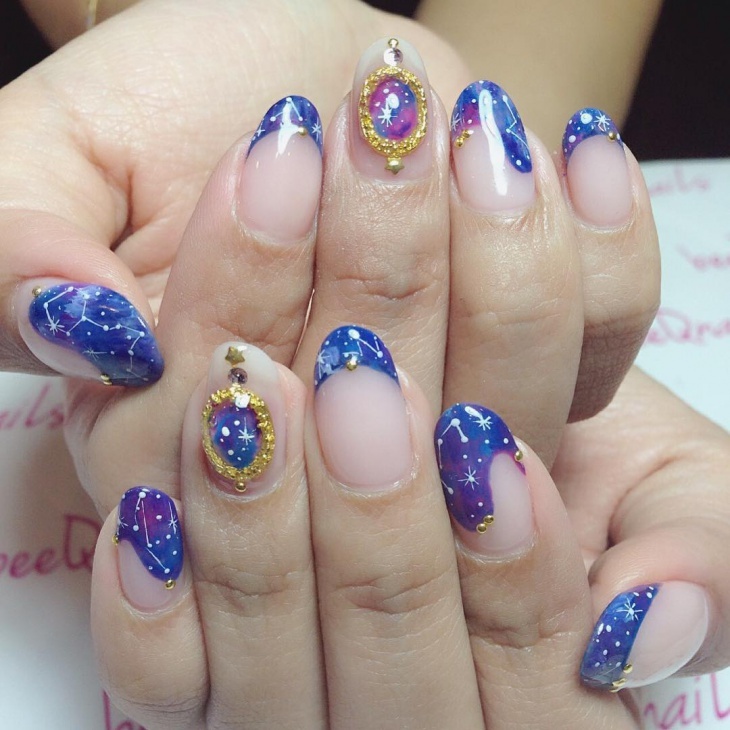 The acrylic nail designs are also very popular now. 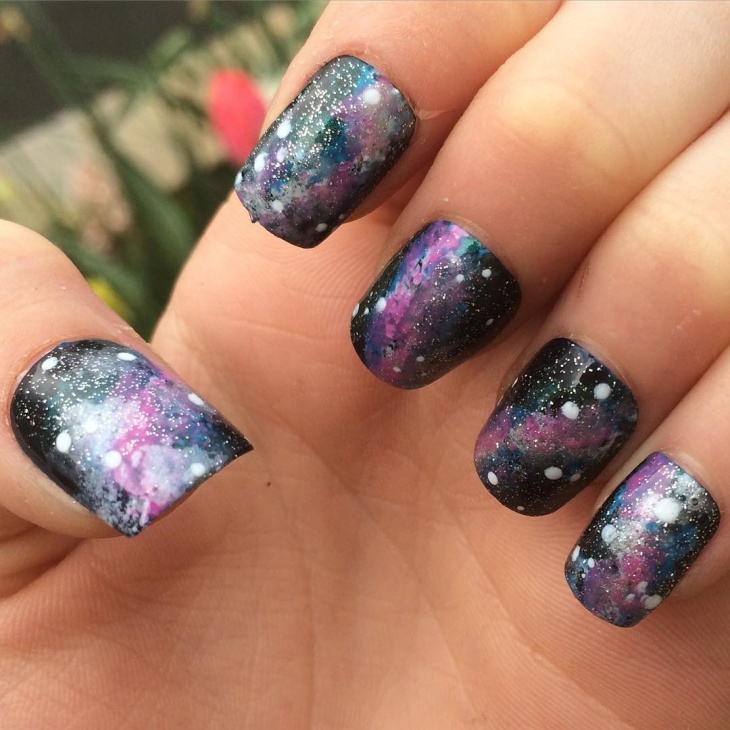 This galaxy nail design in pastel shades of blue and pink is looking great. The lady here added some glitter and has drawn symbols in white to resemble some distant stars. The whole look is amazing and best suits pastel shade evening dresses and ola! you are all set for a party. 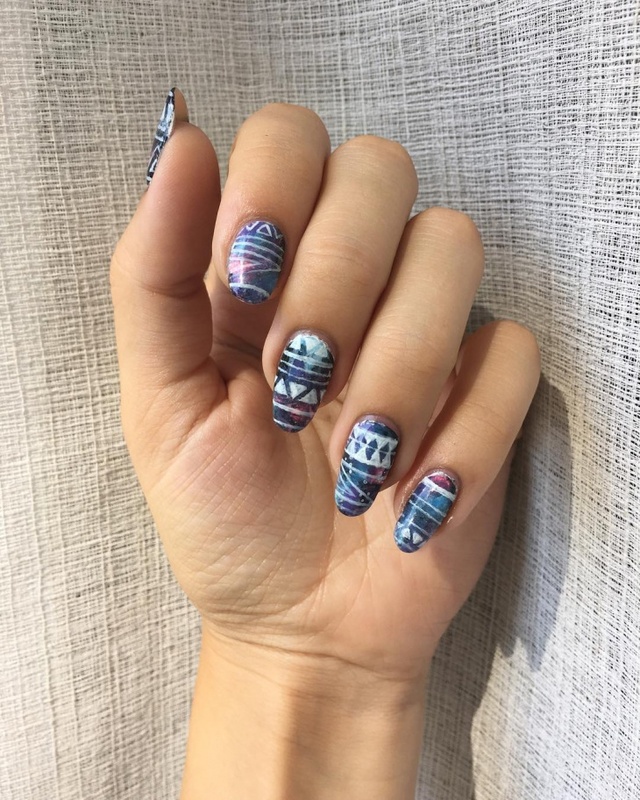 This Galaxy nail design resembling Aztec era symbols is incredibly beautiful. 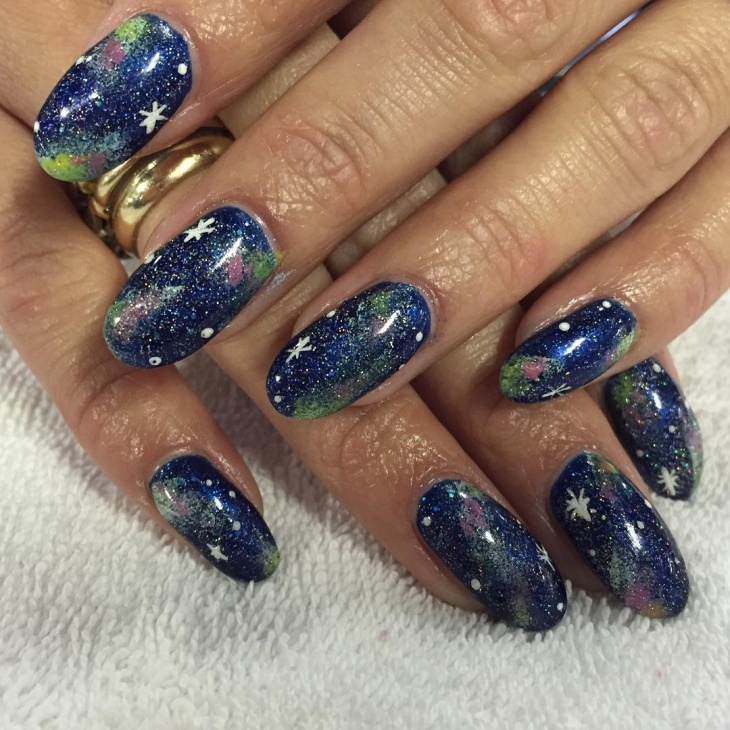 The lady here chose dark blue and a touch of light blue and pink to create an illusion of Galaxy. She used white color to draw the symbols. Come on ladies what are you waiting for! Try this out for a party and look amazing. 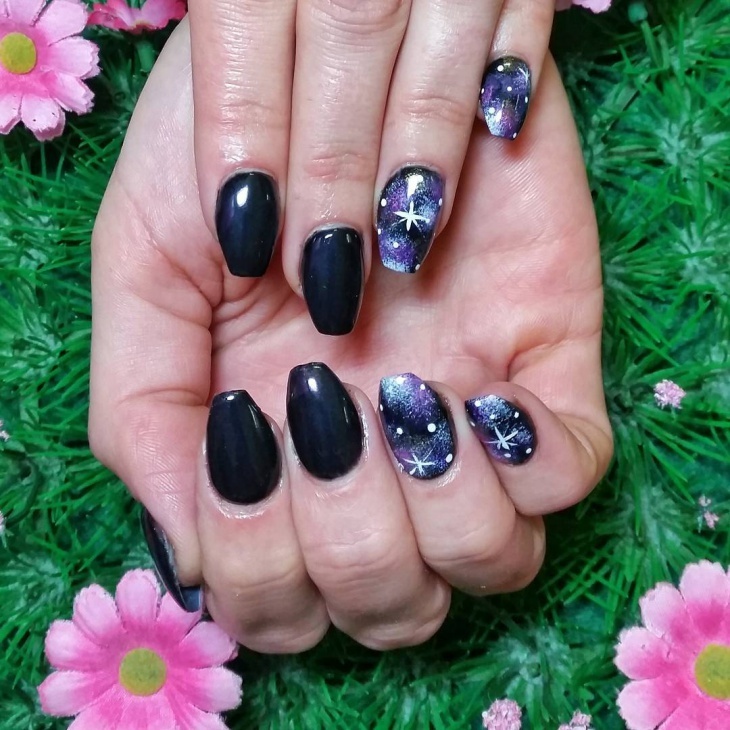 The lady here chose colors of black, pink and orange to create a mesmerizing look of Galaxy on her nails. She then added some glitter and has drawn some symbols resembling stars to make it look perfect. Will there anyone who will not be drawn into it. 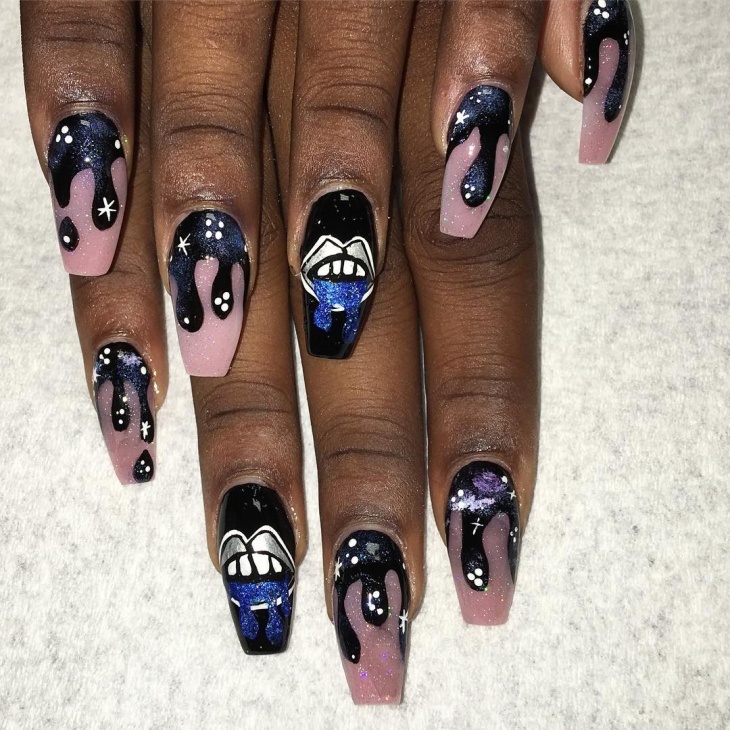 These utterly glamorous Galaxy drip nail design is created in shades of pink, blue and black. Here the lady made an illusory design of black color shade dripping onto the pink shade. She used some glitter and has drawn symbols representing stars is just amazing. 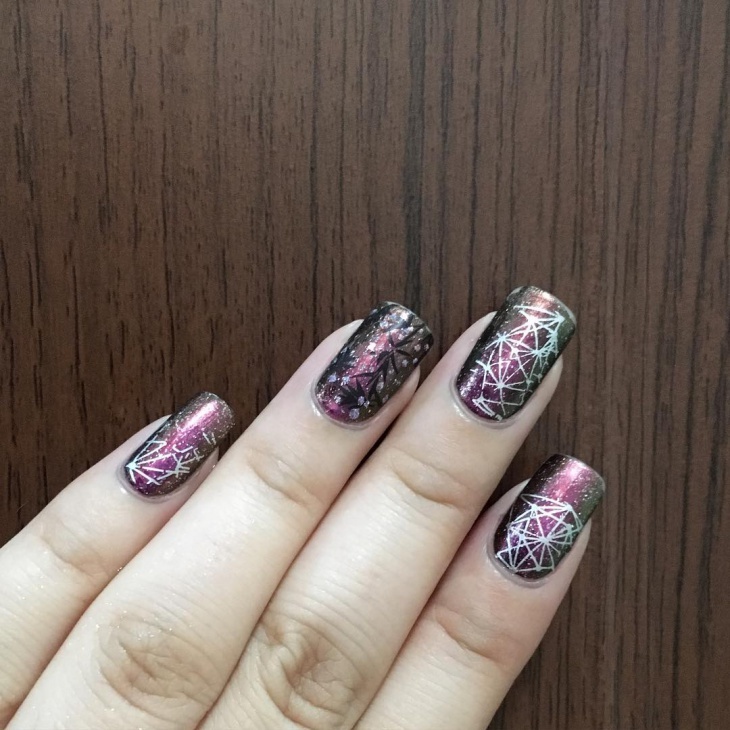 This nail design best suits for a Halloween party or Prom party. Want to see envious faces of your friends? 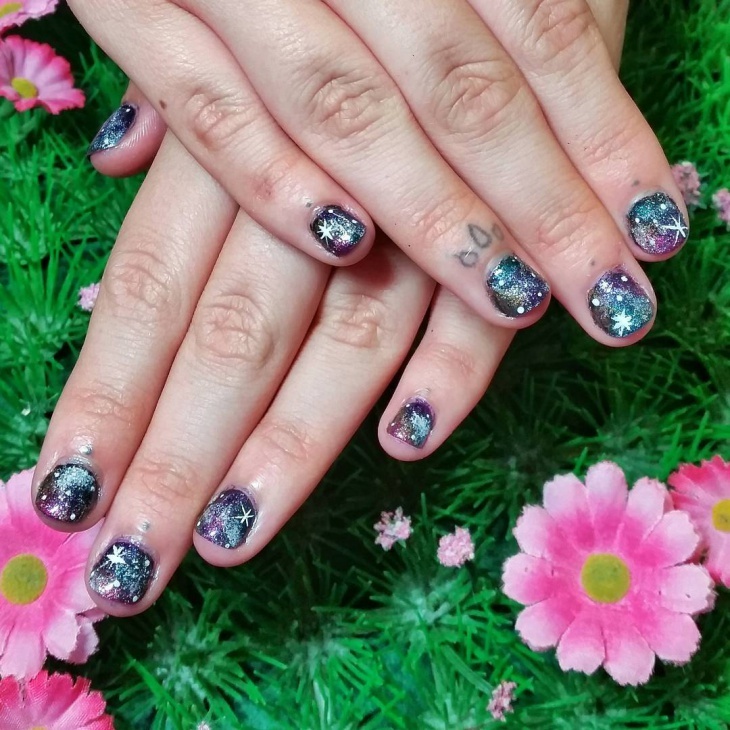 Then try this Glitter Galaxy nail art in shades of black, pink accentuated with glitter and star symbols. 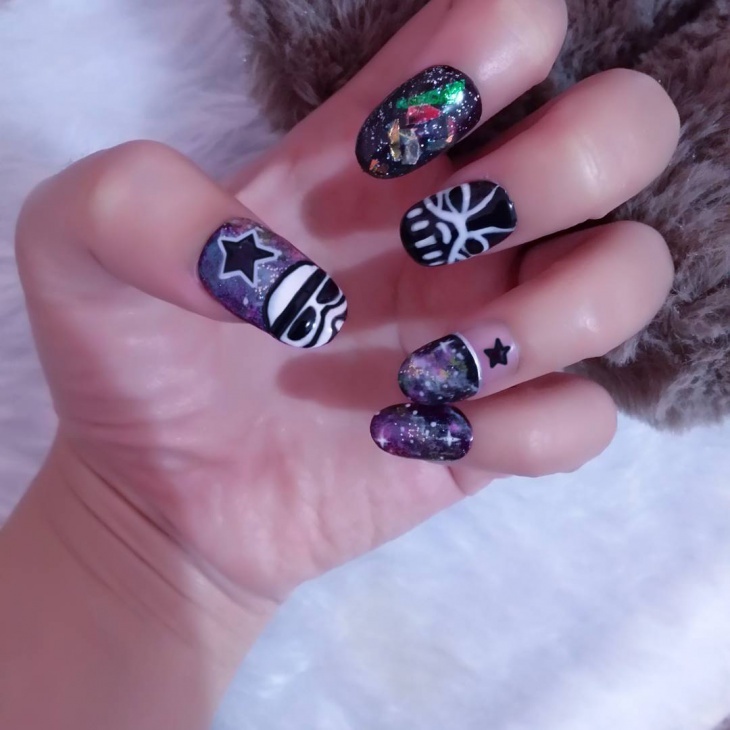 This wonderful galaxy nail design which is done with black gel nail color and some shadings of white on some nails with glitter and star symbols is just a piece of art. Girls, try this nail design and get tons of likes on your facebook pages. 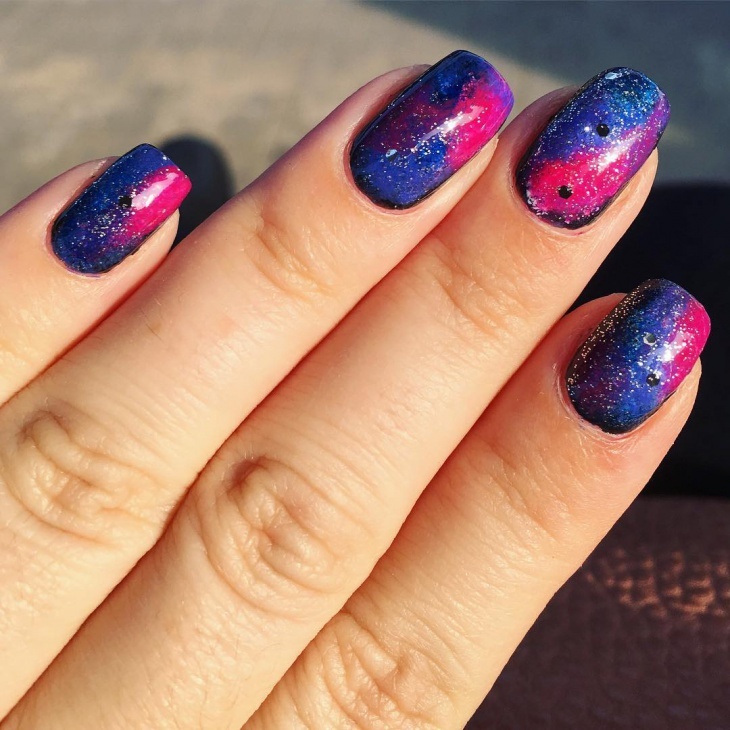 The lady here chose the colors of blue and pink to create colorful galaxy nail art. She used glitter and some simple black dots to complete the look. Who wants to look simple yet amazing? 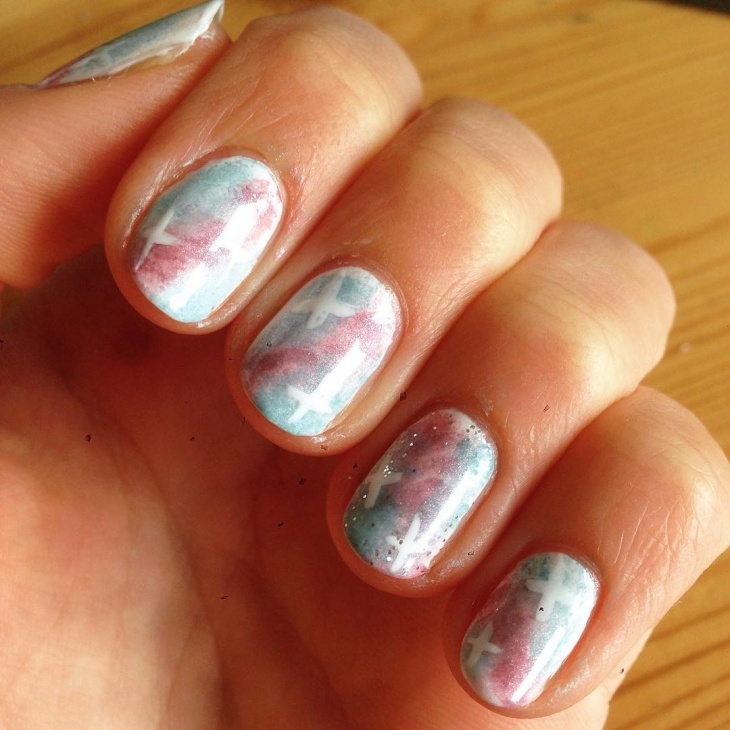 Then try this out nail design art. Ladies, don’t worry if you don’t have those long nails to create a nail art. 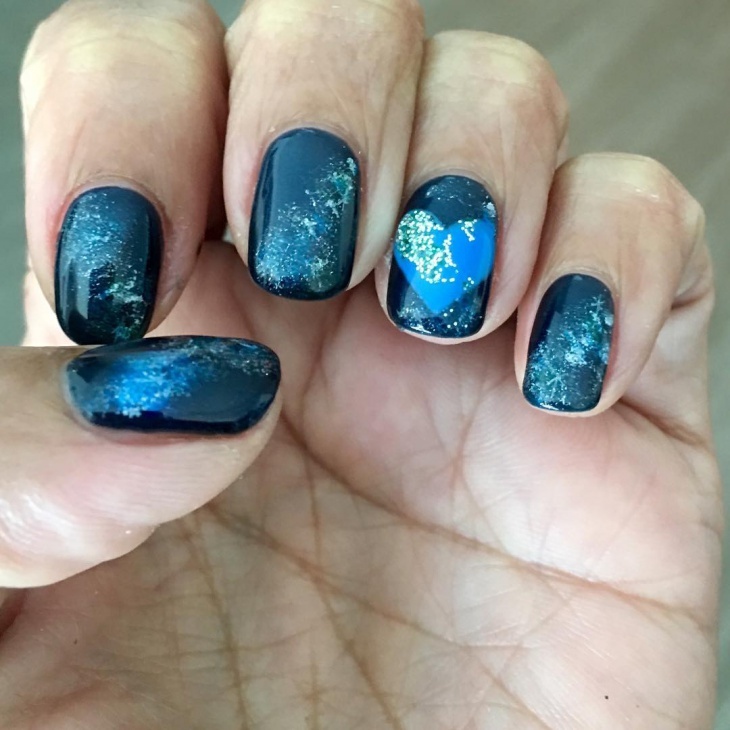 See how this lady created galaxy nail art on her short nails using black nail color, white nail color and some glitter. 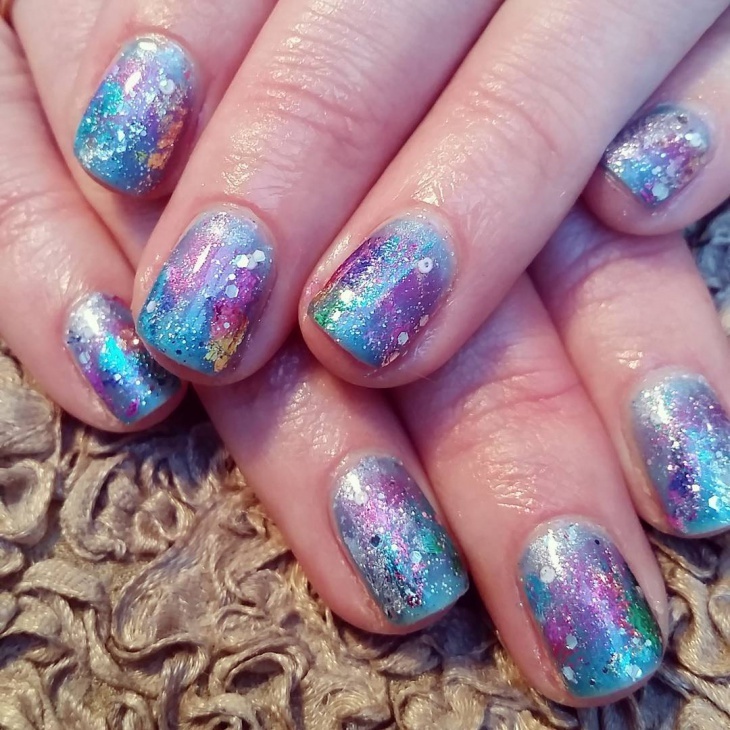 Aren’t the nails looking magical with holographic galaxy nail art? 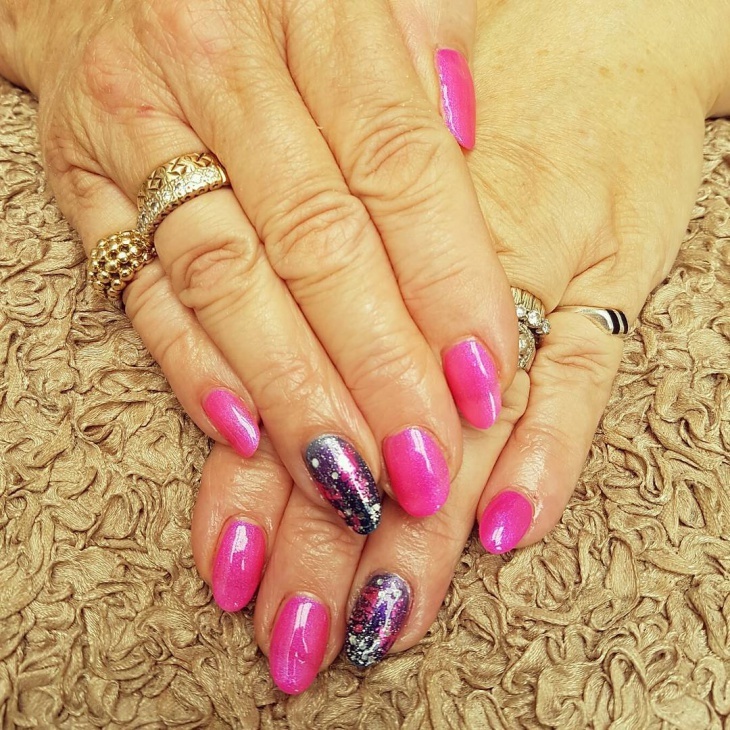 The lady here used dark blue color nail paint, she used some shades of pink and green. Then she used some glitter and white star symbols to complete the look. 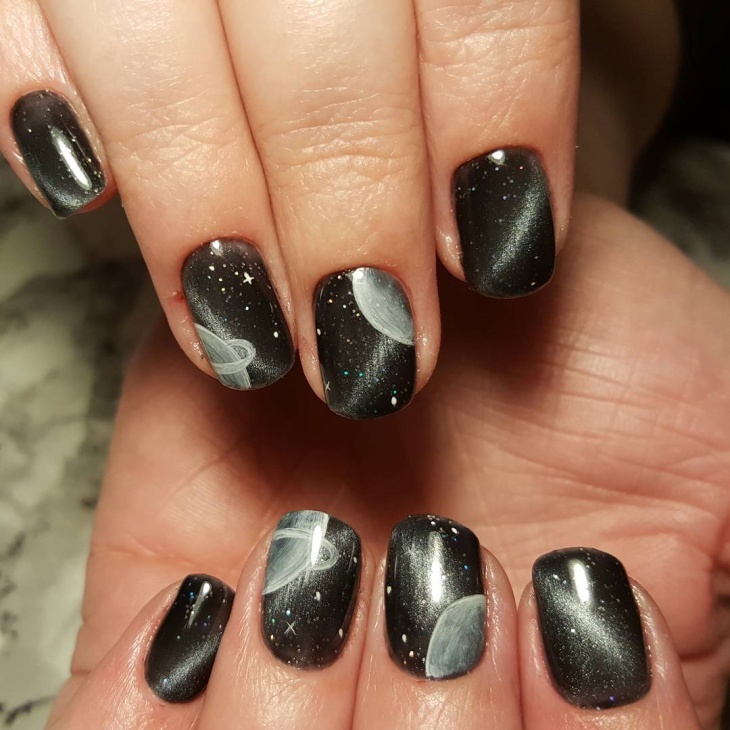 This lady here went for a tribal galaxy nail art! She used the pink and black shades to create a background and then she has drawn some tribal symbols and stars to create a tribal effect. Then added some glitter to complete the look. The end result is amazing and girls we can see you are all getting ready to try this nail art. 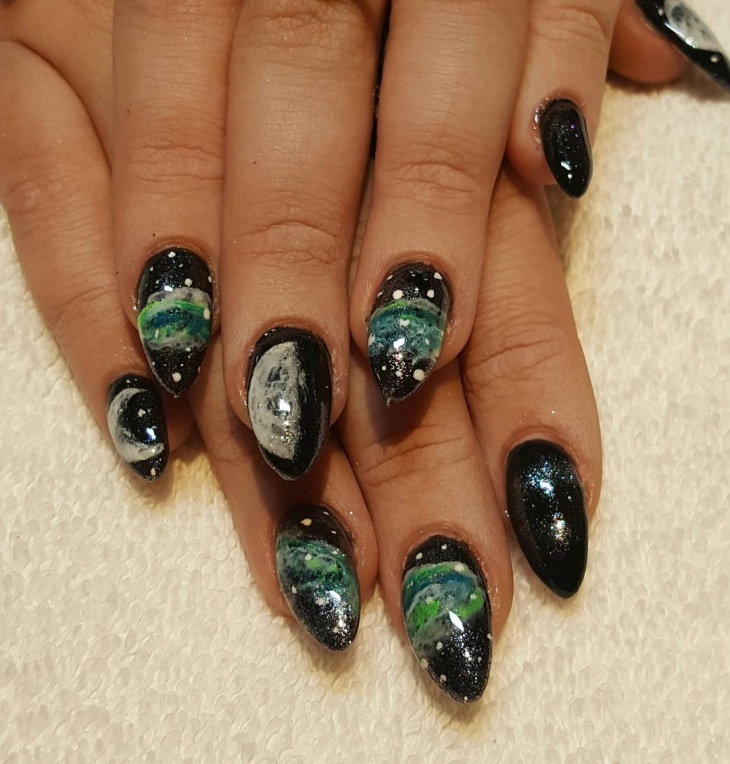 The Galaxy nail art designs are trendy and they can be tried to a prom party, to hangout with friends or to attend a birthday party.